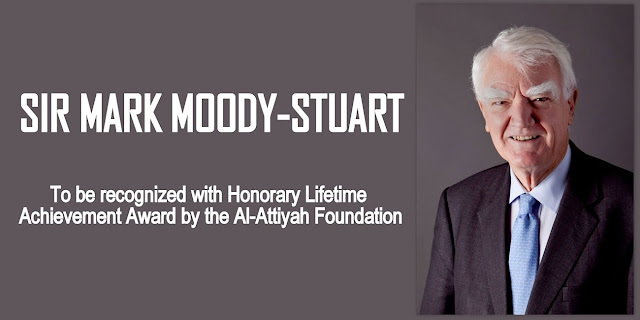 Doha, April 30, 2017 (Gulf Intelligence) – Sir Mark Moody-Stuart, who is Chairman of the United Nations Global Compact Foundation and Vice Chairman of the UN Global Compact, will be this year’s recipient of The Honorary Lifetime Achievement Award for the Advancement of International Energy Policy & Diplomacy presented by the Abdullah bin Hamad Al-Attiyah International Foundation for Energy & Sustainable Development. The Al-Attiyah Foundation bestows one Honorary Award each year to an outstanding global energy leader, and the 2017 accolade will be presented at the 5th Anniversary Gala Dinner event in Doha on May 8th to Sir Mark, who worked with the Royal Dutch/Shell Group for some 40 years after securing his Ph.D. in Geology from Cambridge in 1966, including holding the post of Chairman from 1998-2001. Also Formerly Chairman of Anglo American plc, Sir Mark is currently Director of HSBC Holdings PLC, Accenture Ltd, and Saudi Aramco. “Sir Mark has been an inspirational figure throughout his 50-year career, but it is perhaps his contribution over the last 15 years since stepping down as head of Shell that defines the unique qualities of the man as he has put his weight behind many important social causes,” said H.E. Abdullah Bin Hamad Al-Attiyah. For instance, Mr. Moody-Stuart is Chairman of the Innovative Vector Control Consortium for combating insect-borne diseases and other notable causes. The Abdullah Bin Hamad Al-Attiyah International Energy Award is the foremost global honor to recognize individuals for their lifetime achievement in the advancement of the energy sector. There are a further six award categories of recognition each year for the advancement of the Qatar Energy Industry; OPEC; Renewable Energy; Producer-Consumer Dialogue; Education; and Energy Journalism – with the nominees reviewed by an International Selection Committee. As Chairman of the Foundation for the Global Compact and Vice Chair of the Global Compact Board, Sir Mark has long helped to provide strategic direction to the UN Global Compact, the world's largest corporate responsibility and sustainability initiative, and to champion its initiatives globally. “Sir Mark reflects on the big issues of our time – climate change, corruption, globalization, poverty and the financial crisis – through the lens of having lived, considered and acted on how corporations should be led in the twenty-first century,” Georg Kell, the founder and former Executive Director of the United Nations Global Compact, said at the launch of Sir Mark’s book “Responsible Leadership: Lessons From the Front Line of Sustainability and Ethics”. H.E. Ali Al-Naimi, the former oil minister of Saudi Arabia and Christophe de Margerie, the late chief executive of Total, were the 2016 and 2015 beneficiaries respectively of this Honorary Award for the Advancement of International Energy Policy & Diplomacy, which is only category to be selected each year by the Foundation’s Board of Trustees.